Do we play videogames to escape from reality? Do we drop into videogameland vistas to explore new or familiar territories out creative curiosity? Or are we compelled to ignore our controlless, chaotic world in favor of fanciful fictions? Are fictional worlds candy for our imagination or the full-course meal that enriches us with delicious delights? This could apply to everything from reading, writing, working, overworking, or playing sports, we’ll just focus on videogames for now. I think of videogames more as simple sugar than complex carbohydrate. Both are great for a quick pick-me-up. I play puzzle games like 2048 when I need to rest my mind, I find value in the gamification of tasks from Habitica, and I think there are myriad values to playing any sort of videogame as a reward for working hard in professional or creative endeavors. It’s just we shouldn’t overload on either one of them, either. We should have a well-balanced diet of entertainment, along with foods. Just as we can get sick from eating too much oatmeal or too many Kit Kat bars, we can also get sick from binging in videogames for hours on end. Staring at bright lights, sitting still, and focusing on perfecting certain actions or performing careful aerobatics for hours on end might not be healthy. The same could be said for reading too much. Your eyes could equally get worn out reading under poor lighting conditions. If you write too much or work to the point of exhaustion, just like playing a sport without proper padding, you could injure yourself. The injuries of overindulging in entertainment are more psychological than physical. You might close yourself off to explore Videogameland/Fictionland, which could lead to further inability to cope with reality. Instead of retreating, we should treat life like a videogame. Videogames at their best teach us how to handle reality. At their worst, they do nothing for us. When they help us, they remind us of the value of going out and doing work in exchange for money and inventory items. Did you get the Sword of Kings, Pink Tail, or any quest item by doing nothing? Did the game beat itself or did you play through it? If you used cheat codes… well… there are shortcuts in life, too. If you want to “cheat” at life, consider this: use a timer to do a certain productive activity for anywhere between 5 minutes to 30 minutes. That activity could be studying a career-positive objective or working on something about yourself, then, when that timer goes off, wrap up your work. Set a second timer for 1 hour. Do something entertaining. Rinse and repeat until all of your most important tasks are complete. This insignificantly minor variation on the Pomodoro Technique could act as a retraining of the mind away from procrastination, overindulging in videogames, or any sort of addictive recreation, innocent or otherwise, which could impede us from doing more with our lives. Whether that’s playing more videogames or achieving more in our lives. Inspirations: I wanted to write something to more thematically tie-in with my time here as the on-site journalist at the 2018 Seattle Indies Game Jam. 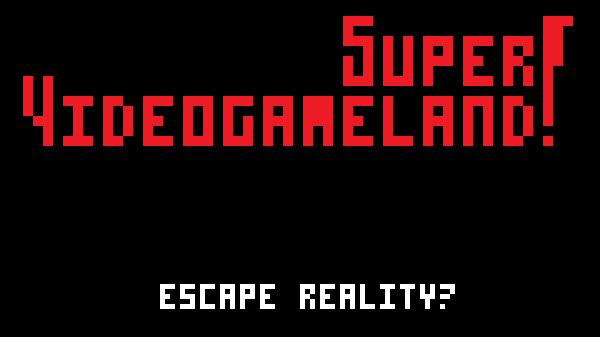 Picture: A mock retro videogame title using ideas from the title and introductory sentence. Note: This essay was not read, approved, sponsored, or endorsed by anyone in the Seattle Indies group, and therefore does not represent the organization. Even though this Sunday column is not G-rated by its nature, I aimed for it.